This could mean that having your ideal keywords in main images on your site might now be more important than it was in the past. 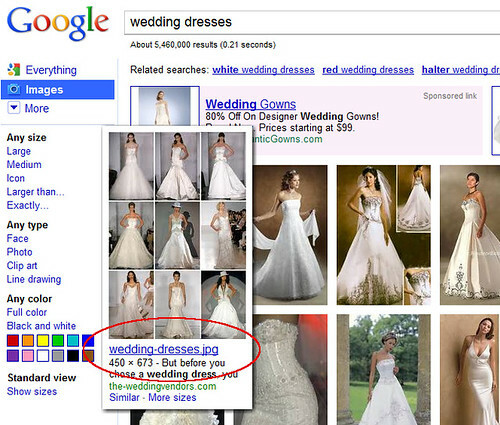 In the two different images I’ve compared above for the search phrase, “wedding dresses” there does appear to be some level of correlation between filenames and rankings in the new version of image results, compared with the old. 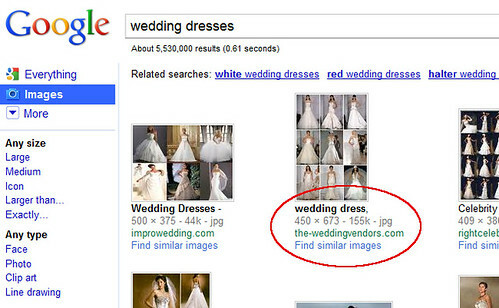 In the old results, the image I show ranking in #1 position has a filename of “wedding-dresses1.jpg”, which is a slightly less-relevant match for “wedding dresses” than “wedding-dresses.jpg”. Having the numeral one appended to the end of the second word causes it to appear to be a slightly different term than having “dresses” without the numeral. Most of the query phrases I’ve looked-at show fairly consistent image search results in the new and old user-interface versions, but if you poke around you can find other examples — and in a number of those examples I found, the image with the closer-matching filename tended to perform better in the new, continuous-scrolling version of Image Search. This could be merely anecdotal/coincidental, but thus far I think the switch to displaying image file names may be a telling change. This entry was posted in SEO and tagged Google Image Search, image search optimization, image seo by Chris Silver Smith. Bookmark the permalink.